IDA Celebrates Monumental Victory For Sea Lions! These gregarious, intelligent sea lions are a part of the river ecosystem. They belong here as much as the salmon, and should never been killed for simply eating. After more than three years of campaigning, I am thrilled to announce that the Ninth Circuit Court of Appeals has finally ruled to block the National Marine Fisheries Service’s killing of federally protected sea lions on the Columbia River between Oregon and Washington. In Defense of Animals (IDA) working with a grassroots group the Sea Lion Defense Brigade (SLDB) have organized against the state-sanctioned sea lion killing while the lawsuit that challenged the program languished in court for years. Now all that hard work has paid off and the sea lions are safe from harm! The court said the government failed to meet the requirements of the Marine Mammal Protection Act and cannot justify killing protected pinnipeds. The sea lion predation of .04 to 4.2 percent of the spring salmon run at the Bonneville Dam could not be considered a “significant negative impact” when the same agencies allow fisherman to take up to 17 percent of the returning fish. IDA congratulates the prevailing plaintiffs, The Humane Society of the United States, Wild Fish Conservancy and two private citizens. This campaign exemplifies how different organizations, working on legal and grassroots fronts, can reach a common goal for animals. This is a huge victory for both sea lions and salmon. We are relieved to see an end to the unethical, politically motivated killing of native, protected sea lions and we hope these agencies will now address the human-caused threats to salmon recovery – over-fishing, introduction of non-native fish, dams and habitat destruction. Since the lethal removal program began in 2008, IDA and the SLDB have worked to protect the sea lions in the Columbia River and hold agencies accountable to the public for this controversial program. Activists organized dozens of demonstrations, met with government officials, and rallied on the steps of the Oregon capital. IDA fought a court battle to free one sea lion named “Willy,” who was misidentified by the Oregon Department of Fish and Wildlife and wrongfully removed from the river. During the 2010 spring salmon season, IDA and SLDB launched a volunteer-based vigil near the Bonneville Dam to track government trapping and killing, and educate the public and fishermen. 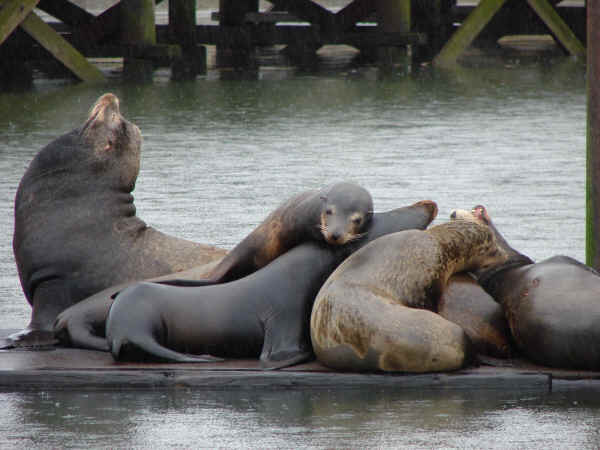 An RV mobile monitoring vehicle called the “Sea Wolf” kept a round the clock watch over the sea lions. Our education efforts have set the record straight. These gregarious, intelligent sea lions are a part of the river ecosystem. They belong here as much as the salmon, and should never been killed for simply eating.